Need a little help with your DIY weaving projects? 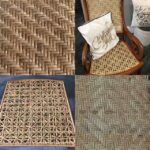 Here are some weaving tutorials on chair caning, wicker furniture repair, natural cattail rush and other types of chair seat weaving techniques I’ve put together just for you! Enjoy! 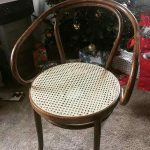 How-to article and tip sheet on the 7-step method of traditional hole-to-hole chair caning instruction, also sometimes called lace cane. 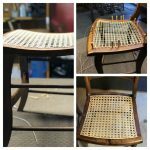 How-to article and tip sheet on removing stubborn chair reed spline from the groove and removing the cane webbing, prior to replacing the new seat cane webbing. 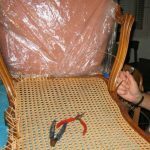 How-to article and tip sheet on the steps necessary to install chair cane webbing, sheet cane or machine woven cane. 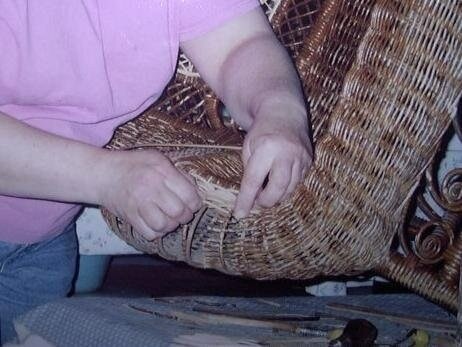 Step by step how-to tutorial and tip sheet on restoring a child’s Victorian wicker rocker, complete with step-by-step photos of the process. Watch the slideshow to see how 1890s wicker furniture gets a new lease on its already long life! How-to tutorial and tip sheet on the description and gathering of cattail leaves for use in primarily rush seatweaving projects and basketry. How-to tutorial and tip sheet on the processing of and weaving with cattail leaves for eventual use in seatweaving and basketweaving projects. 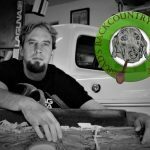 How-to weaving videos featuring chair caning tips, natural rush seats, working with cattail leaves and birch bark and antler basketry. We certainly hope you’ve enjoyed all these FREE tutorials and want to Thank You for your support of this information resource website! 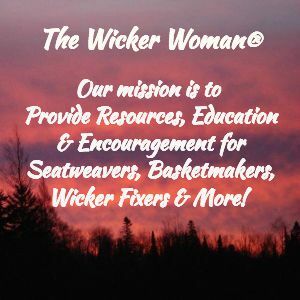 Please share WickerWoman.com with all your friends, family and social networks. Come back often to see the additions and updates!